﻿Establish since year 2000 with thousands of Happy and Satisfied clients including Home and Business owners. Full time in-house employees with multi trade skill and years of experience. Including carpenter, plumber, electrician, painter etc. We are insured and our works are covered with at least 90 days of workmanship warranty. On-site survey and consultation is available with a nominal refundable fee. 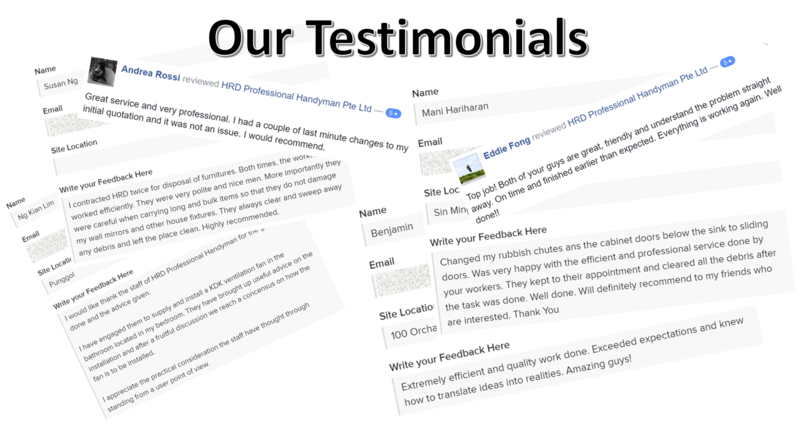 HRD Professional Handyman Pte Ltd with over the past 15 years have established a reputation of reasonably priced, timely and outstanding handyman services. We have accomplished hundreds of remodeling, renovation and small projects throughout Singapore islandwide, and have proudly earned our customers respect with each job. We can proudly say that we are the only full pledge handyman company that is HDB licensed and BCA registered with public liability insurance coverage. At HRD we assist our clients and also potential customer to purchase items that they are looking for. With our wide networks of suppliers local and oversea, we are able to find the products or it's alternative to match the needs of our prospective buyers. When you have project to get done or looking for something, give it a shot by giving us the images, dimensions and its specification. We will do our best to assist you. Just click on the request for FREE quotation button above. HRD did a fabulous job repainting our house and reorganising things. They completed the work to a very high standard. They managed to do everything really tidily while we were still living in the house, which was certainly an added challenge. I appreciate the attention to detail that was made to ensure we were very happy with the finished result. I have been searching for a contractor that willing to take up minor jobs for my laundry room, kitchen and bathroom at home but was disappointed by a lot of companies. Almost gave up but from my last attempt from Google search, I found HRD and I sent my RFQ request. They replied immediately and suggested an onsite survey to understand the job in detail. They were very professional and gave suggestion as to how I should maximise my usage area at laundry and kitchen. Within two days, they came back with reasonable quotation. Job was completed and I am very satisfied with HRD. They do not rush to complete the job, they pay attention to detail and were very polite too. I will definitely engage HRD for my future “home improvement projects”!!! They might not be the cheapest, but they do a fair & good job. Staff are friendly, professional, and understanding. I have a whole house touched-up: took down the old kitchen cabinets/ cornice/ wooden wall decor/ odd lights/electric points, repainted the whole apartment, rewired the electric points in living room, relocated the water point for washing machine & installed electrical appliances. All in all, satisfied. I have no hesitation to recommend them and thank you guys! * All testimonials given above were verified with proof.